I was born with in an M-16 in my hands; I’ll probably die with one. Some of the best gaming experiences I have had involve the Battlefield franchise. I am well versed in what’s expected from a Battlefield game. The latest installment of the Battlefield franchise is Battlefield 3, and it delivers on all fronts. Whether your experience with first-person shooters is limited, or you are a veteran to combat, there is something here for everyone. Battlefield 3 is a bona fide product of value. Battlefield 3 has a campaign as well as co-op mode. There is something lacking to the campaign story; it is a little bland. Thankfully, there isn’t a lot of yelling. It seems like everyone is yelling in other military shooters. I am most offended by the yelling. It’s as if they think I’m stupid, so by yelling they can have me understand the story better. The quieter story here just plays itself out, holding your hand the whole way. I suppose I shouldn’t expect much of a bedside manner from Battlefield 3. The campaign mode really plays like a tech demo or very long multiplayer tutorial. If you are a fan of the series, I would recommend playing the campaign after getting some rounds in on the multiplayer maps. Don’t discount the campaign entirely, however. There are absolutely some standout experiences in the single player; they are mostly scripted, but still fun. Even if you are the kind of player to skip the story and go right for the online, you owe it to yourself to at least get to the jet fighter mission. Lots of people complain about games that are on rails or have scripted events, but I find the best part of going on a ride is sometimes not knowing where you’ll end up. 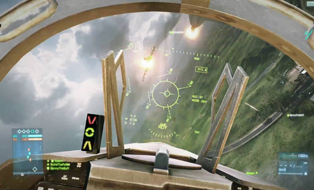 The two big things FPS enthusiasts are excited about are the ability to go prone and the reintroduction of jets. With mostly destructible environments, the ability to go prone makes for always new and interesting places to hide. Some players have said that the ability is an unfair advantage and will change the feel of the game. I tend to disagree with this. By sustaining suppression damage and limiting movement while prone, DICE has made strides to ensure balance in the game. Gone are the wild gamers running around with dual shotguns. Battlefield 3 also features an online stat tracking service called Battlelog. Battlelog is essentially Facebook for Battlefield 3. You are able see what’s going on with your friends, create platoons and compare and contrast a bevy of statistics and features. This feature might be considered unnecessary and part of the bloating process, but I genuinely like it. I like playing Battlefield and I like knowing how I compare to my friends, regardless if they play on PC or console. This type of social network feature has been successful for Bungie, Steam and Battle.net. Those services have been around for years and it has only made their ties with respective communities stronger. The real meat and potatoes of Battlefield games has always been the class-based multiplayer in large environments. The four classes are Assault, Engineer, Support and Recon. As expected, the more you continue to play with a particular class, the more unlockable abilities, weapons and gadgets become available to the player. Let it be known that you start out with a pretty fierce kit from the get-go. This isn’t a trial by fire. Many of the guns you get in the beginning are quite powerful and the most necessary items you will be able to unlock within the first hour or so of gameplay. Vehicles have also always been a major part of Battlefield. Rolling into an area with four and five tanks in formation and destroying tanker trucks can be a really therapeutic experience. Vehicles are not just for those that sit and wait by their spawn points either. Now you can actually spawn right into vehicles if they are available. The impressive maps feature varied environments and experiences, including base jumps, aircraft carriers, night missions and bombed-out subway tunnels. Confirmed DLC map packs will make for many returns back to the front lines. It goes without saying that I really enjoy Battlefield 3, and know I will for a long time to come. I feel like I have barely breached the surface of the game. It is nice to know there is a military shooter out there for me. Battlefield games have always been more team-oriented and less about the individual. The gameplay is smart and fun, even when our team is losing and has its back against the wall. It never feels as though I am fighting in the war alone. A certain amount of competence is required to enjoy Battlefield 3. It might be a little bit faster than you are used to. Don’t get frustrated; just get better at playing. The teams are bigger, the maps are much more vast. Chuck still talks about his time in ‘Nam @japandudegirl. Battlefield 3, from Electronic Arts, is available on PlayStation 3, Xbox 360 and PC.